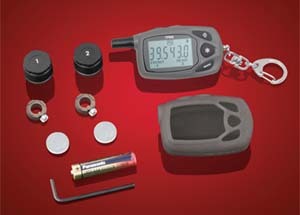 Wireless Tire Pressure Monitoring System! TMLD-2: This all new design incorporates a large 1⅝” x 1 ⅛” LCD display screen mounted in a slim 2-7/16” x 2 ⅝” x ¾” handlebar mounted monitor. It easily mounts to round handlebars or can be face mounted to the brake cylinder face clamp. The handlebar clamp assembly will allow fitment on ⅞”, 1”, or 1⅛” handlebars. The monitor quickly slides into or out of the mount to allow quick removal and remounting. 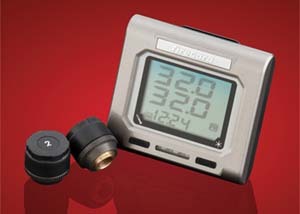 The lightweight, ⅓ ounce sensors feature the latest technology in external sensors on the market and are water resistant. 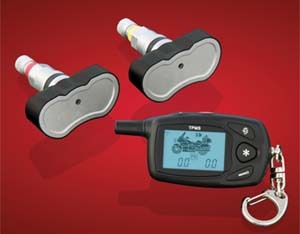 Tire Pressure Monitoring Systems (TPMS) are a proven way to increase fuel efficiency and extend tire life. No tire rebalancing is needed and each sensor comes with a patented anti theft ring to not only prevent theft, but loss from improper installation. The sensors have a unique 20 minute battery saver mode as well as G-Force sensing to wake them up. The monitor comes with its own one hour battery saver mode to insure long life on all components. Includes instruction manual, all batteries, and a silicone protective skin for the monitor. 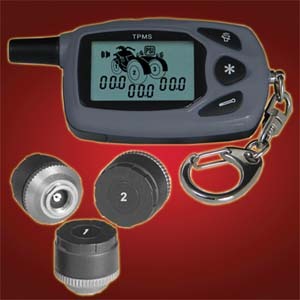 TPTM-1: Economy Tire Pressure Temperature Monitor for Motorcycles. The tire pressure and temperature monitor tool requires a pressure range of 10-70 PSI and a temperature range of -22 degrees to 185 degrees F.
TPMS-2: The TPMS-2 has been updated with an all new easier to read universal display. With the broad market acceptance of TireGard™ the decision was simple to make our 2-Wheel Monitor easierto read with larger read out numbers and a simplified presentation. 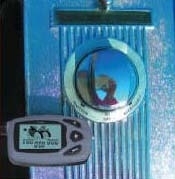 All the same information is still displayed on the 1 ¼ inch key fob display, but is now more easily interpreted, making this top seller even better. 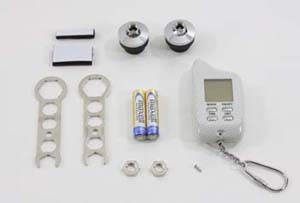 Lightweight 1/3 oz sensors donot require wheel rebalancing and includes G-Force sensing to reduce battery life. Batteries included, 2 minute installation. 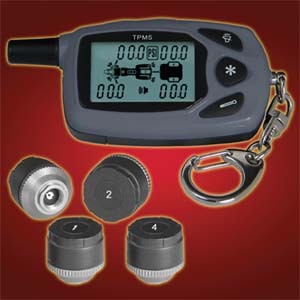 TIREGARD TPMS 2 WHEEL, Wireless Tire Monitor, Easy Installation - 2 Minutes, Batteries Included - No Tools Required. 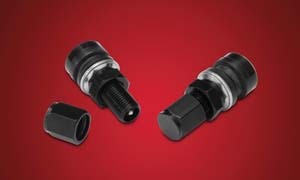 TPMS-2I: eGlideGoodies introduces the new TPMS-2I with internal sensors. This new internal sensor performs the same as the screw on external sensors, but mounts inside the rim. 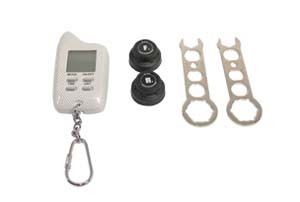 The fob size monitor can fit in your pocket or Tux Tie pouch and will beep and vibrate to warn you of pressure or temperatures outside of the selected ranges. Selectable low pressure range from 10-50 psi, selectable high pressure range from 21-60 psi, and selected temperature range from 104°-210°F. The sealed battery on these internal sensors should provide about 5-7 years of service life. The G-Force technology extends battery life by automatically sleeping until a change occurs. As not all rims are created equal, the TireGardTM system with internal sensors comes in two sizes; the 13-325-33 to fit .327” valve stem holes as seen on many Harley rims. 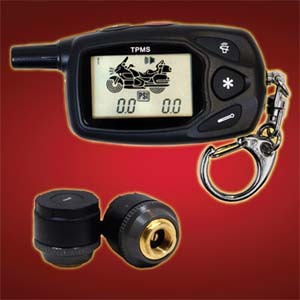 TPMS-4: Product for motorcycles w/trailers. VS-01: These Aluminum Tire Valve Stems from are available in either silver finish. Their low profile is only 1 3/16” in length, making them fit any tight space needing a compact stance. The metal base will not pull thruthe wheel rim, which needs a minimum of 8mm hole for clearance. An inner and outer rubber grommet washer provides a leak proof seal. An external nut allows for easy tightening of the valve stem for any needed maintenance. Sold as a pair. VS-01B: Similar to above, but in black anodized finish. VS-EXT: It can be frustrating to reach that hard to get to tire valve stem to get the air chuck on to check and add air. eGlideGoodies has simplified this process with this Lock-On Valve Stem Extension. 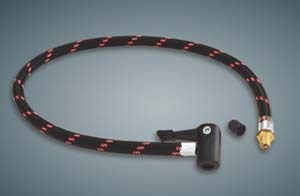 This convenient 24” flexible nylon air hose lockson with a snap to your tire valve stem extending access 24’’ allowing easy access for checking and filling any tire. 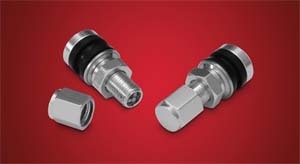 This Lock-On Valve Stem Extension actually improves safety by making it easier to do routine pressure checks and fills. The braidednylon hose is durable for years of use. Designed for convenience with a 24” long nylon air hose with a universal lock on stem connection. LOCK-ON STEM EXTENSION, 24" Valve Stem Extension, Universal Fitment.